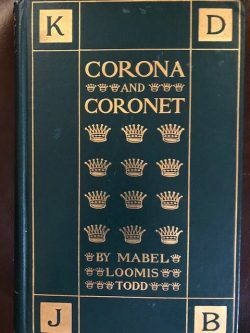 Corona and Coronet Being a Narrative of the Amherst Eclipse Expedition to Japan, in Mr. (Arthur Curtis) James’s Schooner-Yacht Coronet, to Observe the Sun’s Total Obscuration 9 August, 1896. Boston: Houghton, Mifflin, 1899. 2nd edition. Handsome blue-green cloth, with gilt lettering and decorations. T.E.G. 383 pages including index. Numerous photos. Good to very good condition. Todd an American writer usually associated for her works of Emily Dickinson was married to an astronomer. This is more of a travel book than a scientific account. Much on Hawaian Islands and extensive travel accounts within Japan including the Ainu people of Hokkaido. Mr. James’ Yacht Coronet is currently in Newport, RI where it is being restored at the International Yacht Restoration School (IRYS). $100.00 Postpaid in the U.S.
Additional Provenance: Morris & Howland, Yachting in America Bibliography, page 146. Toy, Adventures Afloat, A Nautical Bibliography #689 – an extensive review. Captain Paul Cuffe’s Logs and Letters, 1808 – 1817.